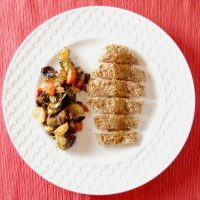 Satisfy your kids’ cravings for chicken fingers in a healthier way with this crispy whole grain baked panko crusted chicken. Can I let you in on a little secret? My five year old girls have never had chicken fingers or chicken nuggets. While you’re picking up your jaw from the ground, let me explain. I was actually a very avid chicken nugget eater as a child, but not the kind from fast food places. Rather I’d eat the ones from a box you’d find in the freezer aisle. Definitely not as unhealthy as the deep fried nuggets and chicken fingers that are on every children’s menu, but not the healthiest option either. My mother also made an amazing chicken schnitzel, which was breaded and pan-fried – I could never get enough of that meal as a kid. In case you’re wondering, I wasn’t exactly the most adventurous eater as a child and most people would probably say I was “picky” (by the way, I strongly dislike classifying kids that way). When it came time to bring my own children to restaurants, I didn’t want to go the traditional route of ordering off the kids’ menu, where the options generally consist of chicken fingers and fries, macaroni and cheese, grilled cheese and fries, and pizza. My girls, who I like to call little gourmet foodies, have always eaten what my husband and I eat at home (no short order cooking in my house! ), so when it came to restaurant meals I was not going to make an exception. As the girls have gotten older, I have worried that if we go out to eat with their friends they would ask for the chicken fingers they see on their peer’s plates, but luckily for me this hasn’t happened yet. They love their grilled cheese with (sweet potato) fries just as much as any other kid, but they’re also happy getting a veggie burger, fish tacos, or sharing what I order for myself. And in fact, my girls have never actually asked for chicken fingers at a restaurant or at home. Maybe because I make my own version – this Baked Panko Crusted Chicken, which is crispy, flavorful, and doesn’t compare to what’s served from a package. 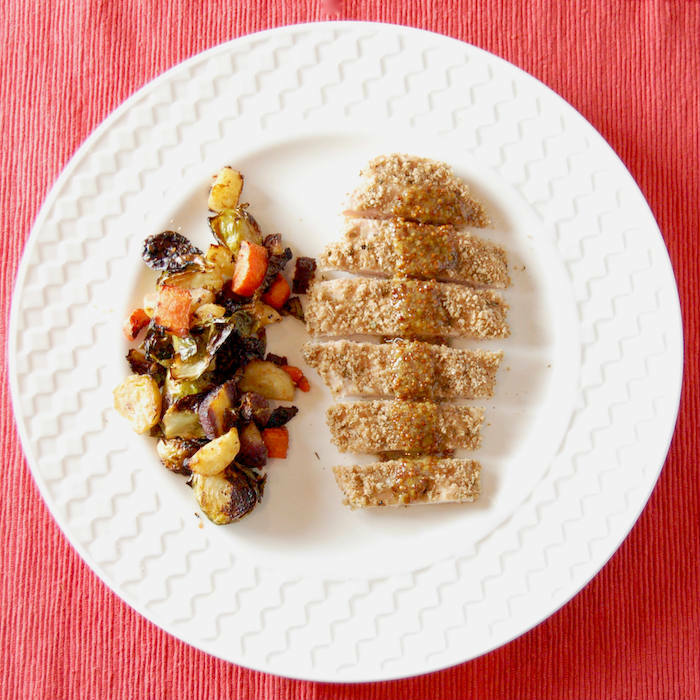 I have been making baked panko crusted chicken for a long time – well before my girls were born. My husband happens to love fried chicken (who doesn’t?! ), but he knows I would never make it at home, so this has been the substitute for years. I’ve tweaked the ingredients and the way I prepare it along the way, and have finally perfected the recipe. Today is the perfect day to share this recipe with you because it fit within this month’s theme for The Recipe ReDux. This recipe includes numerous items I always have on hand – chicken breasts in the freezer; whole wheat panko, dried herbs and spices, and honey in the pantry; whole grain Dijon mustard and eggs in the refrigerator; and garlic on my kitchen counter. Let’s just say that this is a meal I can whip up in 30 minutes even if I haven’t been to the supermarket in days. I use thinly pounded boneless, skinless chicken breasts, which I find work better than using thick cutlets that get crispy on the outside but not fully cooked on the inside. The thin cutlets also cook up quickly, making this a quick and easy weeknight dinner – definitely something every family wants and needs! My butcher sells thin sliced chicken breasts, but if you can’t find them you can pound regular chicken cutlets or buy chicken tenders. Instead of traditional bread crumbs, I use whole wheat panko. If you’re not familiar, panko are Japanese breadcrumbs that are lighter and coarser than regular bread crumbs, which helps keep your “fried” food healthier because they don’t absorb as much oil and fat. They’re lower in calories and sodium and higher in fiber than traditional Italian bread crumbs, plus they stay crisper after cooking. Most panko that’s widely available is not whole wheat, so be sure to look for the whole grain variety (Kikkoman and Ian’s are two brands I have found at the supermarket). Panko is pretty bland on it’s own, but I don’t mind that at all because it allows me to flavor it with the herbs and spices I want. For this panko crusted chicken I add marjoram, herbes de Provence, kosher salt, and freshly ground pepper to the dry panko. I have also at times added chili powder and other spices, so feel free to mix it up and make your own flavored panko. Unlike most recipes that call for breading, I don’t use any flour to make this panko crusted chicken. I coat each chicken cutlet in a garlic egg wash (simply made by whisking one egg with freshly minced garlic), followed by the herb panko. I then place the cutlets on a wire rack set over a foil-lined baking sheet. This last step is the KEY to crispy baked chicken. For years I made the chicken directly on the baking sheet, but one side would always get soggy. Baking the chicken on the wire rack allows for air flow all around the chicken, which maintains the crispy texture of the coating. 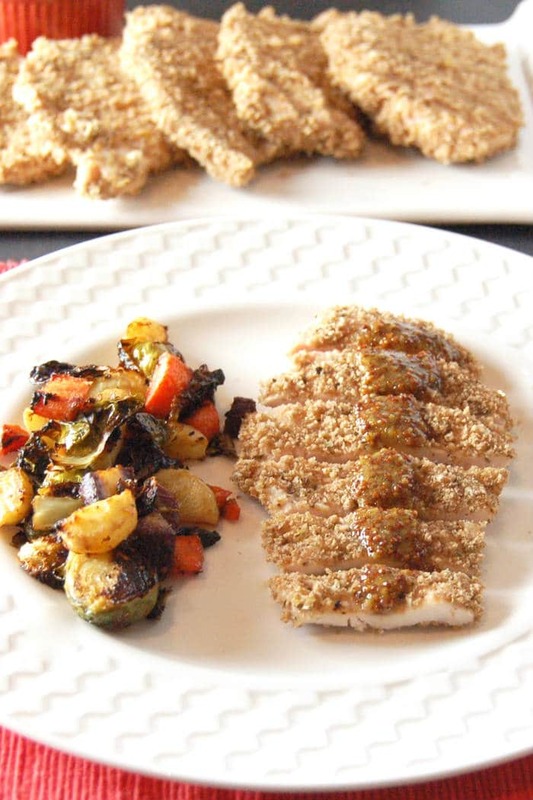 While most kids eat chicken fingers and nuggets with fries and ketchup, I love serving my panko crusted chicken with a side of roasted vegetables and a simple honey mustard sauce for dipping. You really can’t get easier than this – grainy Dijon mustard and honey are whisked together. That’s it. Yes, it takes about a minute longer than just squeezing the ketchup out of the bottle, but it adds a little kick to the chicken and takes the dish up a notch. Ready to satisfy your kids’ cravings for chicken fingers in a healthier way? Here’s the recipe! 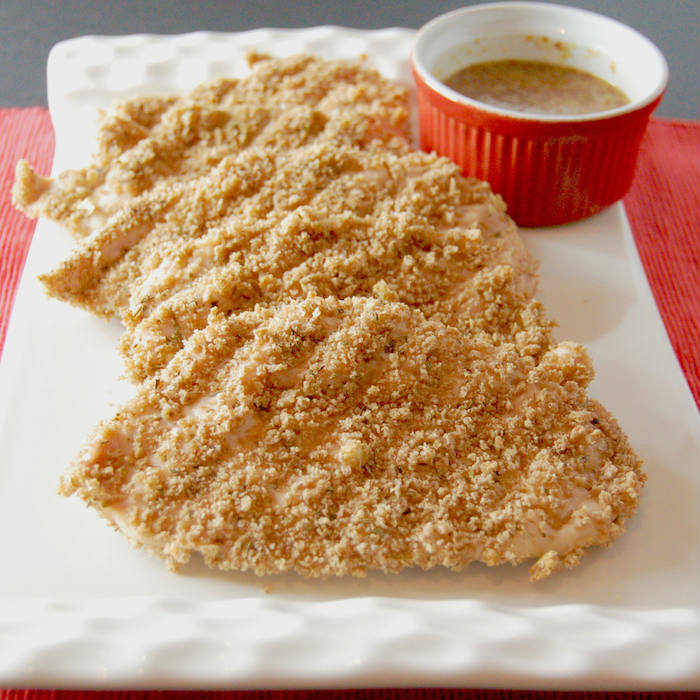 Thinly sliced chicken breasts are coated with a whole grain panko-herb mixture and baked until crispy. Serve with a simple honey mustard sauce for a dinner the whole family will love. Preheat oven to bake at 400 degrees F. Place a wire rack on a foil-lined baking sheet and coat rack with cooking spray. Set aside. In a shallow bowl, combine panko, marjoram, herbes de Provence, salt, and pepper, to taste. In another shallow bowl, whisk together the egg and minced garlic. Dip each piece of chicken in the egg wash, coating both sides, and then transfer to the panko herb mixture, making sure to coat each piece evenly. Remove the chicken from the panko, shaking off any excess coating, and place on the prepared wire rack. Bake chicken for 12 minutes and then flip and cook another 5 to 8 minutes until the outside is crisp and the chicken is cooked through. To make the honey mustard sauce, whisk together the mustard and honey. Serve with panko crusted chicken. Are your kids nuggets fans? Do you think they’d like this healthier version? Try it out and share with me in the comments below. Great way to make a healthy version of chicken fingers for the kids! I’m sure these disappear fast at the dinner table! Nice tip for baking the chicken on a wire rack to get it crispy! Thanks Lindsay! I rarely have leftovers from this meal, unless I purposely make extra (and even then sometimes there’s none left!!). And glad you like that tip – it took many tries to perfect it, so needed to make sure everyone knows the trick!! That panko crust!! Only one of the girls and my husband eat chicken but I think this would make me try it again. I’ve been trying to add more things to my diet but it’s a texture thing with chicken. I bet I could use this delicious crunchy crust on other things. Sarah, let me know if you end up trying chicken again, but if not, this crust would definitely be great on fish and I am sure it would be good on tofu too, although I have yet to try it. But if you do, I’d love to hear how it goes! This reminds me of a dish we always had growing up. It was a family favorite! So happy this brings back memories for you! Hope this version becomes a family fave too! These look delicious, Jessica! And good for you for keeping your girls away from the darn kids menu. I wish kids menus were not a thing and rather smaller portions of anything on the menu was offered instead. Thanks so much Jodi. It’s not always easy – sometimes I’m tempted to go the kid’s menu route for that exact reason – portion and price. When my girls were younger I would get one regular entree or even an appetizer off the regular menu and they would share it, so it was actually pretty much the same price per kid. But now that they are vocal about what they want to eat it gets pricey. I know it’s not something everyone can afford to do, that’s why I’m so happy when I see children’s menus that offer grilled chicken or a piece of fish. Definitely need more of those around. I love using Panko. This looks delicious! What’s your favorite way to use it Elissa? Thank you! Great idea about baking the chicken on a wire rack – makes perfect sense to get it nice & crispy! We use panko all the time for our white fish, but haven’t tried it on chicken in a long time. Need to make it, as I (and the boys) love crispy chicken. On another note, kids meals are so disappointing! Though some good restaurants “get it.” We usually bring Lucca’s food (still) from home, but we’re getting to the point where he’ll be ordering with us. Heartening to know that the girls opt for what you’re eating/the healthier options. Thanks so much Jenny! Can’t wait for you to try the panko on chicken again! I totally agree with you – I wish more restaurants “got it”! I hope Lucca continues to order with you and enjoy it the way my girls do! Thanks for sharing your thoughts. This looks great! Panko is pretty much a staple in my house – I love its crispy taste. Can’t wait to try this! Thanks Charlene! It’s always a staple in my house too. Hope you enjoy it! What a great way to make this healthy! Love that your kiddos are little foodies. Those kids menus are awful! Thank you so much Julie! Hehe…it makes my heart so happy and brings a smile to my face every time I say to a waitress, “no, we don’t need a kid’s menu”!! This looks like a great alternative to store bought nuggets or hitting up the drive thru. Surely even the pickiest child couldn’t resist these right?? They look great, and this coating could be great on other things as well. Thanks for sharing! Thanks so much Kristina! I can’t imagine a picky eater not liking it either! And yes – so much you can do with that coating – fish, tofu, pork (if i ate it!). These look so yummy! Great alternative when the kids (of all ages) are craving some fast food chicken! Thanks Christy! Absolutely – the big kids in my house (aka my husband and me!) love thus recipe too! Love this recipe – something my whole family will enjoy! Thanks so much Lauren! Can’t wait for you to try it. Be sure to let me know how everyone liked it! i love when you can make simple, delicious recipes with ingredients you have on hand…i will be giving this a try very soon. Thanks Dixya. There’s really nothing better than that ease, right?! Can’t wait for you to try it! Yum! I love using panko crumbs! I did something similar with tempeh once and it was so good! So glad you’re a fan! I just recently tried tempeh for the first time. Bet it was good w panko! I hope he does Deborah! Ahhhh I can’t wait to make this! My son loves chicken fingers and this seems like a perfect healthy dinner option. Plus, that mustard on top looks so yummy. Thanks Chrissy! Looking forward to hearing how your family likes it! Thanks Angela! Hope you enjoy! Definitely putting these on my must make list! Always looking for better for you dinner options! Yum! Thanks emily! Can’t wait to hear how you like it! I looooooove panko on chicken! There’s a restaurant nearby that does the same thing but they stuff it with cheese! I’m so glad to hear that! I’m sure that restaurant’s chicken dish is yummy! Thanks abbey! So funny you mention shake and bake, because that’s another version of “fried” chicken my mom makes! Love this! I make a version of this with almond flour to make it gluten free! My nanny kids sound like your girls- adventurous foodies! That’s great you have a gluten free version! And wonderful to hear the kids you take care of are adventurous eaters! I’ll make the chicken for my kids and the roasted veggies for my husband and myself. Wait. The side is roasted veggies right? Let me know how your kids like it! Yes, those are roasted veggies with it, but you can pair whatever side dish you’d like. I just happen to love roasted veggies with everything, lol! Looks delicious, Jessica. Can´t wait to try your twist! Thanks so much Denine! Hope you enjoy it! This looks really tasty! I love anything honey mustard. Thanks so much Kerri. The sauce is delicious on so many things – would make a good sandwich spread too! 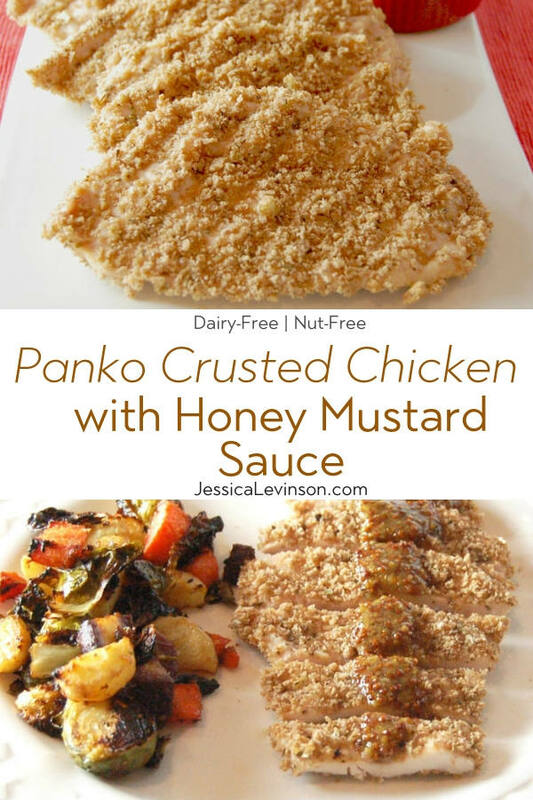 I love using panko to add incredible crunch to chicken and fish! Yours looks perfect, Jessica! Yes, so good! Thanks Marisa! That honey and mustard sauce sounds amazing – I want to put it on everything. This chicken looks so crispy! Haha I use that sauce on lots of recipes! Enjoy! Thanks Mary! I hope you do give it a try! These chicken fingers look SO good. I’m definitely going to be trying these for my daughter’s school lunches! Thanks Wajeeha! I can’t wait to hear how you like them! What a great substitution for fried chicken. The panko bread crumbs make this so crispy and delicious. Thanks Kelly! I love using panko and baking to keep it healthier!